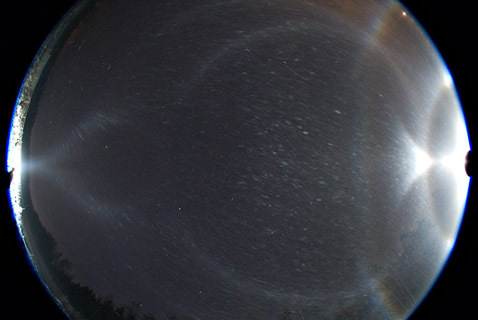 I too observed diamond dust halos the same night. Moilanen, Tricker, heliac.. the usual suspects are back together again. I seriously need to consider moving close to a ski resort. Basic display. Those pyramid crystals make me wonder once again about Moilanen arc. A couple of pyramids in crystal photo is not enough to make any odd radius halos. From that point of view every crystal photo from Moilanen arc display must include a multitude of Moilanen arc crystals. Yes, move near to ski resort Lauri. The more we get photos of diamond dust displays, the merrier. WWWEEEHHHOOOO!!! Good one Jukka!! I wish I lived near Perfect North Ski slope but I don't. Can't wait til I get to so some more spray gun halos. Oh. Almost forgot make sure we do some below horizon displays for sub-kern, sub-cza, sub-120p and sun supralateral and lets get the divergent displays like superparhelia and other exotic halos. Great to see the season is beginning. Well done Jukka. I'm also looking forward to your photos, Jari. Every time the season begins I start thinking about how nice it'd be to put the lamp on a pole/mast and see how the halos change when we move the lamp up and down. Imagine a video of that! Thanks, it was fun to have some diamond dust action after several months. But like Marko said, the stuff was exactly what you get every time when you switch the torch on in a crystal swarm. Agnes, I had the opportunity to see the halos change form under the lamp in the first photo at my site (the one with Parry arc). The lamp was very close to ski resort and its beam was favourable for creating halos. As I walked towards it I could, for instance, see Moilanen arc move closer to 22 halo. When I moved even closer to the lamp, the M-arc seemed to disappear, but whether this was due to its true behaviour or caused by reduction of ice crystals between me and the lamp, I don't know. I have plans to elevate the lamp off the ground. Not much, but enough to separate between certain halos which overlap at zero degrees. I'll simply put it on a tripod on top of the car and that's it. Around Hyvinkää, where I mostly chase halos, the topography does not offer natural places for that, so I have to use the car roof and a tripod. The closer camera is to the lamp, the more elevation. Closer to the lamp the display gets also brighter, but probably there is a point where you are too close for the lampward halos, that there are just not enough crystals between the camera and the lamp. To the opposite direction it should not be a problem. Also, very lose to lamp the size of the light source may get inconviniently large. Anyway, this issue should be experimented with. Ágnes, I did not manage to shoot any photos as I had mistakenly left all my memory cards home. Perhaps this is why Riikonen did not mention my display at all in his post. Anyway, I observed the helic arc as well as extremely bright diffuse and Tricker arcs (best I have seen). Of course, there were also a bunch of more common halos. Intensity thresholds were also easy to see with a naked eye. So it was a great display that ranks among the best I have seen (concerning diffuse & Tricker arcs). Going to be doing anything below horizon such as sub-kern, sub-cza, sub-120p or other halos? Also in the photos looking away from the lamp I can see bluespot very clearly. Jari, you need to keep the memory card with at all times when you have the camera. Sure, Michael. As I mentioned earlier, in my area it is challenging to create elevation difference between lamp and camera. There is one place, where it would be very possible, but typically the currents do not lead the crystals that way. Therefor I have to come up some other ideas, which surely do not give large elevation values - maybe in the order of 2 degrees tops. I simply forgot about your observation, Jari. Certainly because of the missing photos. Jukka, it is good that you are thinking about the elevational difference. We have seen enough of the 0 elevation displays. I have bought a humangous tripod in order to elevate the lamp a bit. I still need to rig a platform for the lamp though. Michael, I always have memory cards and even spare cards in each of my camera bags. This time something just went wrong due to some weird cosmic reasons I presume. I can assure you I felt exasperated standing there in the beam with all the glory around me. It is too bad these days you can't enjoy the sight unless you know it's being also photographed. And when you photograph, it takes from the visual experience for one thing because you can't be in the middle of the beam at the same time with camera. So, no matter what, you are never getting full satisfaction of the display visually. Except when you're lying on your back while an all sky image is being captured. I've done that and it is quite a good method. But yeah, usually the panic is on. When you lie down and camera is one or two meters higher, you are out of the beam center and thus you are not getting all of the display. Especially if the lamp is close, you lose plenty by lying down. In retrospect I should have just stayed and get a pen and some paper from the car. But my heart bleeds when I'm losing photo opportunities so I guess I had no choice. If photography is not an option, then only oil on canvas will do. I look forward to more snowgun halo action I can only dream about. That ski resort Perfect North is over an hour away so I will use the paint sprayer. Hope to see some superparhelia along with the subhorizon plate arcs. With the help of my brother I got a job now and I like a lot.